Entitled ‘A new direction for UK resource strategy after Brexit’ and put together on behalf of the Circular Economy Task Force – a business forum for resource use policy, innovation and business – the new report seeks to identify the risks associated with Brexit. It makes a series of recommendations for the government’s upcoming resources and waste strategy to lay out a path to ensure that the UK’s departure from the EU does not create a weaker waste and resources policy framework for the UK. For the first time in decades, Defra will be solely responsible for the UK’s waste and resources policy, going it alone without the oversight of the European Commission and the Court of Justice of the European Union (CJEU). Much of the UK’s current environmental protections are wrapped up in EU directives, such as the Landfill Directive (1999), the Waste Electrical and Electronic Equipment (WEEE) Directive (2002) and the Registration, Evaluation, Authorisation and restriction of Chemicals (REACH) regulation (2006), while the final negotiations for the Circular Economy Package are underway. “The resource policies we choose after Brexit will have a real effect on people’s lives,” said the report’s author Libby Peake, Senior Policy Adviser on resources at Green Alliance. “We’re at a crossroads – we can either improve our protections and use of resources or revert to simple waste management. The wrong decisions could harm our environment, businesses and citizens. Brexit will mean the UK will no longer, technically, has to adhere to EU ecodesign standards, opening up the possibility of poorer quality products entering the UK market and undercutting UK businesses, although businesses will still have to maintain standards in order to trade with EU member states. Through the Coolproducts Coalition, major producers, including Electrolux, Philips and Bosch, have called for the acceleration of ecodesign regulation, estimating that a more ambitious directive could deliver a net saving of €90 billion a year for businesses and consumers, while WRAP estimates that longer lasting, repairable and modular products would enable new business models leading to £4.4 billion in financial benefits between 2017 and 2025 for the UK alone. The EU’s current recycling targets expire in 2020 and there has been no promise of replacing them in England as of yet. The devolved governments have established ongoing targets, but there is currently none for England, which produces the vast majority of waste in the UK and therefore controls its recycling rate. A lack of ambitious targets could see the UK slip behind its European neighbours on progress on recycling provisions and reducing landfill capacity. Analysis from Defra has indicated that 65 per cent recycling would result in £2.5 billion in waste sector savings, £4.9 billion in social savings and 44 million tonnes of CO2 equivalent greenhouse gas emission savings by 2030, but the government has also made clear that it considers the Circular Economy Package’s proposals to be ‘too high to be achievable’ and has often stated its preference for voluntary commitments instead of mandated ones. Leaving the EU would entail leaving the EU’s REACH regulation, which would mean an instant loss of access to a world-leading database on chemical safety covering more than 25,000 chemicals. REACH regulates tens of thousands of substances and replaces dangerous chemicals with safer ones, and makes manufacturers responsible for managing the risks. It would be very expensive for the UK to set up its own regime – the government has admitted that the cost of taking on the roles currently provided by the European Chemicals Agency could be in the “tens of millions of pounds” – and would require duplication of bureaucracy and safety testing. Adopt a producer responsibility scheme to minimise taxpayer subsidy of a waste management system that allows wasteful design and inefficient recycling. The report states that whatever the Brexit deal the government comes up with, resources and resource productivity will need to be key considerations going forward, and there is ‘significant scope’ to manage our resources better. Green Alliance is part of the Greener UK coalition, set up to protect the interests of the UK’s environment during Brexit. The group has been periodically updating a Brexit Tracker to assess the ongoing risks to environmental policy throughout the process and in its most recent update, in October, gave the waste and resources sector a ‘high risk’ label, saying the outlook for waste and resources remains ‘highly uncertain’. It stated that the sector was at high risk in terms of governance, legislation and principles and strategies, with the government’s 25-year plan for the environment still in the wind, Defra’s clear reluctance over recycling targets, the department’s lack of funding (it is set to see a 15 per cent reduction in its resource spending between 2015 and 2020) and the insistence from Michael Gove that the UK will be leaving the jurisdiction of the CJEU, an institution that provides crucial oversight for environmental protections. 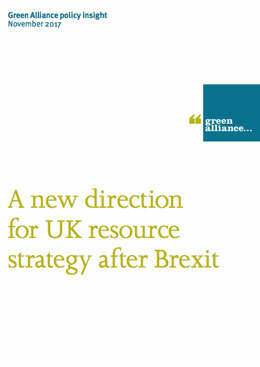 The ‘A new direction for UK resource strategy after Brexit’ report is available to read and download on the Green Alliance website. Greater producer responsibility, more consistent recycling systems and the revisitation of pay as you throw should all be considered to make English recycling more efficient, says the Green Alliance. “16 full-time civil servants” will fill the environmental governance gap in the event that the UK leaves the EU without a withdrawal agreement, a situation Environment Secretary Michael Gove has described as “sub-optimal”. An agreement has been reached by the Department for Environment, Food and Rural Affairs to maintain 100 per cent of the UK’s notified waste shipments to the EU in the event of a ‘no deal’ Brexit.